Nathaniel "Nat" Turner (October 2, 1800 – November 11, 1831) was an American slave and Christian preacher. He believed God gave him visions. Turner thought an eclipse in February 1831 was a sign from God to plan a slave rebellion. The rebellion happened in Southampton County, Virginia on August 21, 1831. Seventy black people took part. Some of these people were free, and others were slaves. The rebellion lasted two days. Soldiers ended it, but Turner escaped. He was found on October 30. Turner was executed on November 11 by hanging. He was skinned. At least 55 white people were killed in the rebellion. The state executed 55 people, but acquitted a few. 200 black people were killed by groups of white people. Slaves as far away as North Carolina were said to be connected with the rebellion. Many were tried and executed. Because of the rebellion, new laws were made in Virginia. People could not bring black people together to teach them how to read and write. It was also made illegal for black people to have church services without a white person with them. ↑ "Nat Turner's Confession". http://voyager.dvc.edu/~mpowell/afam/Turner.htm. Retrieved January 17, 2011. ↑ "Nat Turner leads slave rebellion". African-American registry. 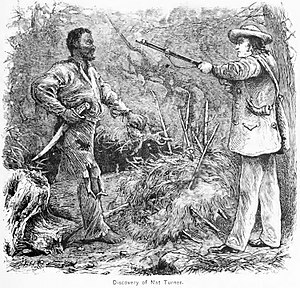 http://www.aaregistry.org/historic_events/view/nat-turner-leads-slave-rebellion. Retrieved January 17, 2011. ↑ "Nat Turner's Rebellion". Public Broadcasting Station. http://www.pbs.org/wgbh/aia/part3/3p1518.html. Retrieved January 17, 2011. ↑ "Nat Turner's Rebellion". The Library of Virginia. http://www.lva.virginia.gov/exhibits/DeathLiberty/natturner/. Retrieved January 17, 2011. This page was last changed on 13 May 2013, at 22:43.